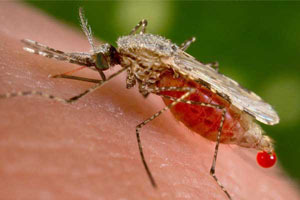 The Anopheles stephensi mosquito is a major vector of malaria in India and the Middle East. A team of researchers from UC Irvine and the Pasteur Institute in Paris have produced a model of the Anopheles stephensi mosquito that impairs the development of the malaria parasite, inhibiting the mosquitoes from transmitting the disease through their bites. Irvine — Mosquitoes bred to be unable to infect people with the malaria parasite are an attractive approach to helping curb one of the world’s most pressing public health issues, according to UC Irvine scientists. Anthony James and colleagues from UC Irvine and the Pasteur Institute in Paris have produced a model of the Anopheles stephensi mosquito — a major source of malaria in India and the Middle East — that impairs the development of the malaria parasite. These mosquitoes, in turn, cannot transmit the disease through their bites. Alison Isaacs, Nijole Jasinskiene and Mikhail Tretiakov of UC Irvine and Isabelle Thiery, Agnes Zettor and Catherine Bourgouin of the Pasteur Institute contributed to the study, which received support from the National Institute of Allergy & Infectious Diseases — a National Institutes of Health entity — through grant number R37 AI029746. Be the first to comment on "Transgenic Mosquitoes Can’t Transmit Malaria"